Clusters of Galaxies formed - Solar System Planets And Moons Section. Rovers are Getting a Little Dusty. Now on the surface of Mars for longer than a year, the twin Mars Exploration Rovers, Spirit and Opportunity, are getting pretty dusty. Both rovers have a fine coating of dust 1-10 micrometers thick which is starting to obscure their solar panels. Spirit has gotten more dusty, with about 70% more dust, so it's getting less power. This could be because it's windier around Opportunity's landing site, which is constantly blowing away the dust. It's also cold enough at night that frost forms on the rovers. This could be clumping the dust together, and causing unexplained boosts in electricity coming from their panels. Missing Matter Could Be Clouds of Gas. NASA's Chandra X-Ray Observatory has located two huge clouds of interstellar hot gas that could partially explain where all the matter is in the universe (we're not talking about Dark matter here, just regular matter that hasn't been seen yet). 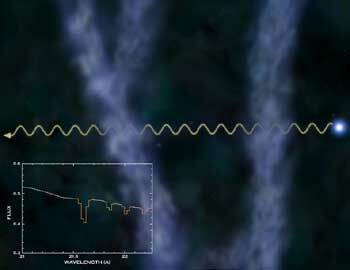 Computer simulations predicted that this missing matter could form into a weblike structure of gas clouds, from within which clusters of Galaxies formed. These clouds have defied detection until now because of their low density. Astronomers used Chandra to watch a distant Galaxy which has been brightening for about 2 years. Their data showed that two separate clouds of gas containing ions of carbon, nitrogen, oxygen, and neon were absorbing X-rays from this galaxy.